With WWE’s Monday Night Raw taking place in Pittsburgh earlier this week, a handful of the top pro wrestling superstars stopped in for workouts at official Intimidation Clothing dealer Wright’s Gym in Crafton just outside of the Steel City. All of those WWE superstars – including 2-time WWE champion Daniel Bryan, current United States champion Dean Ambrose, 4-time Intercontinental champion Kofi Kingston, former United States champion Antonio Cesaro, and current WWE tag team champion Seth Rollins – were given an official Wright’s Gym/Intimidation co-branded tee shirt. The pro wrestling superstars were looking for a gym that is for elite athletes, and what they found was Wright’s Gym in Pittsburgh, who was also featured in a recent Intimidation Dealer Spotlight piece. For more information, check out www.wrightsgym.com, or find them on Facebook. For more custom gym apparel from Intimidation Clothing, visit IntimidationClothing.com. 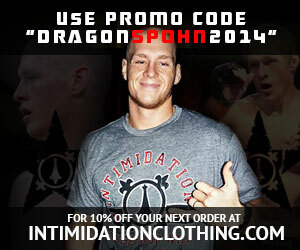 Intimidation Clothing is pleased to announce that the popular brand is now a featured brand on MMAOutfit.com. As the first online store established in Malaysia in 2012, MMAOutfit.com is a leader in providing customers with latest products and clothing direct from the United States, Brazil and France at a competitive price. MMAOutfit.com also strives for amazing customer service and the fastest delivery within in Malaysia and also internationally. Along with selling Intimidation, MMAOutfit.com sells many of the other top MMA-related clothing brands, including Venum, TapouT, Jaco, Throwdown, UFC and more. Intimidation Clothing is excited to announce that a wave of new supplement dealers have signed on as official dealers for Intimidation product. The new additions bring the list of official Intimidation dealers to well over 50 authorized outlets. CastIronSupplements.com has been a catalyst in making many of the deals come to fruition, as the company is one of the fastest-growing outlets in the supplement industry. Cast Iron Supplements is known for its offer of free shipping on every product with no minimum order, as well as its line of top-level mass builders, proteins, fat burners, pre-workouts, vitamins and more. Intimidation has also added its first Australian dealer, as Gladiator Nutrition is now an official distributor in the land down under. Gladiator Nutrition carries a variety of top of the line supplement brands including LiveLong Supplements and is located in Blakehurst NSW, Australia, about 20 miles from Sydney. In Florida, Intimidation has added PHF Supplements in Jacksonville as its first authorized dealer in the Sunshine State. PHF Supplments is best known as a quality provider of the best prohormones, bodybuilding supplements, vitamins, and more. Intimidation has also added two new web-based dealers, as both Pro Hormone Warehouse and GetSupps are now official retailers for the fast-growing brand. PHW offers a full line of products, including prohormones, amino acids, protein, energy supplements, and more. GetSupps is a dealer of the top lines of every product category on the market, from muscle builders to creatine to test boosters. Another new addition is LyonsProteinSource.com, a fast-rising supplment dealer. The company focuses on recreational body builders, looking to build lean muscle mass. While more supplement retailers are expected in the near future, the Intimidation brand as a whole has experienced tremendous growth in adding new dealers in 2013. The new list of dealers include two new Intimidation resellers apiece in Indiana, Illinois and West Virginia as well as new dealers in Ohio located in Canton, Lisbon, Mt. Vernon, Paulding and Portsmouth. Intimidation Clothing is pleased to announce the addition of yet another authorized dealer in the Midwest, as Intimidation Clothing will now be available in the Chicagoland area at Premier Fight Supply (@PRMRFightSupply). A full service brick and mortar martial arts supply store – and the only of its kind in the Chicagoland area – Premier Fight Supply has everything in stock for both fighters and fans alike, including boxing gloves, MMA gloves, jiu-jitsu Gis, t-shirts, accessories, and everything in between. After continuously having trouble ordering products online including wrong products and wrong sizes, owner Greg Kass opened the store with the idea in mind of eliminating those problems. The brand new store opened in May 2013 and is located at 4045 Oakton Street, Skokie, Illinois 60076. Premier Fight Supply joins a list of over 50 authorized Intimidation dealers throughout the United States. Over the past year the Intimidation brand has rapidly been growing in the state of Indiana and yet another dealer has signed on to sell Intimidation products. Hays Action Sports in Sullivan, Indiana, a store with strong ties to MMA, motocross and paintball, is the latest addition to Team Intimidation. Hays Action Sports, retailers of MMA and boxing gym and training gear, as well as paintball accessories and gear is likely best known for their full line of dirt bike, ATV and street bike parts and services. Hays Action Sports provides “only the highest quality products and while making them affordable for athletes on any budget” and is a regular sponsor and attendee of MMA events throughout the region. Hays Action Sports, online at HaysActionSports.com, becomes Intimidation’s second dealer in Southwest Indiana, a region where the brand’s name is strong, as they join Mojo’s Screenprinting in Vincennes, Indiana. The Intimidation brand continues to expand at a rapid rate and further proof is seen in the latest company announcement as Gladiator Nutrition is now Intimidation’s official distributor in Australia. The deal means that in addition to selling the Intimidation brand to consumers across Australia and on their popular Web site but will also allow Gladiator Nutrition to handle other Intimidation orders from interested parties within the country’s borders. Gladiator Nutrition is located in Blakehurst, a suburb in southern Sydney, in the state of New South Wales, Australia. Gladiator Nutrition carries a variety of top of the line supplement brands including LiveLong Supplements and is located in Blakehurst NSW, Australia, about 20 miles from Sydney. From time to time, Intimidation Clothing likes to take the time to profile a few of our top dealers. Esther’s Sports Cards & Collectibles in Ashtabula is one of those dealers that has seen continued success with the Intimidation brand over time. Located in the Ashtabula Towne Square, Esther’s Sports Cards & Collectibles features a large variety of sports cards, memorabilia and collectibles. Ideally located across from the food court and the main entrance of the mall, Esther’s sells a variety of Intimidation top sellers as well as a few closeout items. The store is also a big draw for their Yu-Gi-Oh, Pokemon and Magic the Gathering Tournaments which are held every Saturday and Sunday. Those interested in checking out Esther’s Sports Card & Collectibles can visit them at the Ashtabula Towne Square at 3315 N. Ridge East in Ashtabula, Ohio.